The Arrogant Worms-Chris Patterson, Trevor Strong and Mike McCormick, will play Doghouse Studios this Saturday. Submitted photo. Formed in Kingston in 1991, The Arrogant Worms have toured across Canada, the U.S., United Kingdom and Australia, but have yet to visit their neighbours in Napanee-until Saturday. 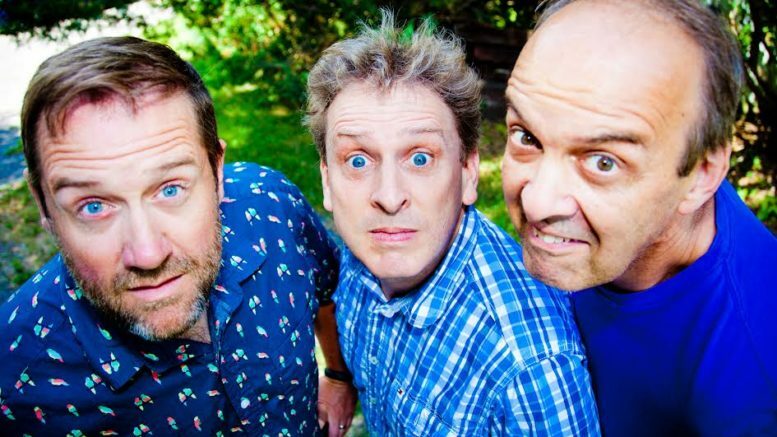 The well-known singing comedy troupe, who makes their living performing spoof songs that take a unique look at the Canadian lifestyle, will take the stage at Napanee’s Doghouse Studios, starting at 7 p.m., performing their ‘Christmas-ish Show’. Strong recalls the memory of having to drive around Toronto, hand delivering the album to fans who were unable to receive it by mail. One need only flip through the song list of Christmas Turkey and see titles such as ‘Santa Got Arrested’, ‘Dad Threw Up On Christmas’ or ‘Christmas Turkey Blues’ to see this won’t be a typical Christmas show. It’s that unique sense of humour that has kept the band going for 27 years while selling over 160,000 copies of their 13 albums. Strong says Saturday’s show will feature about 25 per cent Christmas songs, the rest songs from their other albums. And though every one of their songs is just one big joke set to music, Strong says they seem to endure the test of time more so than any stand up routine could. Strong says they also made a conscious effort to focus on a very general topic, not a specific event when writing a song so that it wouldn’t get dated. He attributed that to being ‘too lazy’ to have to keep writing new songs. Now well into their 27th year of making music, they’re still going strong, releasing about one song per month on their website www.ArrogantWorms.com. Strong says they’ve always had ‘just enough’ demand to keep going and calls it a blessing in disguise that they were never signed to a major record label or had a breakout year. Instead they’ve turned to avenues such as a KickStarter campaign to fund their 2016 release The First Farewell Album. Instead, three arrogant worms from Canada have found a way to stand the test of time in a very difficult music scene. Tickets for Saturday’s show are $30 and can be purchased at https://www.ticketscene.ca/events/21661/.